PRODUCT: 1/4-14 x 7/8 in. HWH TEK Lap Screw, with solid cup head & sealing washer. 250/Bag. Price/Bag. (SFS #S5076-FF). Shipping leadtime 4-7 business days. Lap Seams in metal roofing or siding. 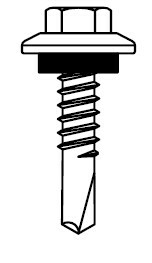 Impax™— Sealer — Drill Screws 1/4-14 Impax sealer for fastening metal-to-metal and Metal Lap Seam. Integral cupped 5/16" Hex Washer Head configuration fastener with an EPDM sealing washer instead of the traditional bonded sealing washer.